The geometry of a world map is remarkably similar to the geometry of spacetime. Science educators are using maps as models for teaching Einstein’s theory of general relativity. In a physics classroom in Norway, high school students sit in front of an interactive simulation that instructs them to "scroll to warp time". Working in pairs, they’ve explored the geometry of a world map and now continue to do the same on a spacetime map. But in curved spaces, geometry can play tricks on you. And tricky geometry lies at the heart of Albert Einstein’s theory of general relativity. Physicists and science educators are now beginning to explore how maps can be used as powerful tools for teaching Einsteinian physics. From the 17th century, physicists had treated gravity as an attractive force between massive objects. However, despite the experimental success of this theory, no one had been able to explain the true source of gravitational phenomena — a problem that led Isaac Newton, father of the gravitational force model, to call his own theory a “great absurdity”. Realising that gravity is geometry, Einstein saw through nature’s trick of curvature. His discovery was an astounding accomplishment. For an entire decade, Einstein had grappled with a new description of gravity that would be consistent with special relativity. According to classical physics, gravity acts instantaneously over long distances. Alas, such a description contradicted Einstein’s claim that nothing can move faster than the speed of light. In 1915, Einstein succeeded in adding the finishing touches to his theory of general relativity. Avoiding the conceptual absurdities of the gravitational force, general relativity interprets gravity as a manifestation of the curvature of our universe. In Newtonian physics, time and space are static features. They furnish the background against which distance and time are measured, and ultimately, against which the laws of nature take place. Einstein’s take on the workings of our universe was bolder. By merging time and space into a dynamic four-dimensional fabric called spacetime, he allowed time and space to take active roles in the laws of physics: spacetime reacts to the presence of massive objects, it bends and ripples, and it deflects the path of light and the orbits of planets. General relativity revolutionised the scientific worldview in the early 20th century, and it hasn’t lost any of its relevance. "It seemed like a fantastic vision of physics for the future,” reflects David Blair, director of the Australian International Gravitational Research Centre, on the first detection of gravitational waves in 2016. Gravitational waves are a feature of the dynamic fabric of spacetime. These ripples in spacetime give physicists and astronomers completely novel ways to explore the universe. But despite the theory’s scientific importance and public popularity, most students at school still only learn about outdated concepts of gravity. "Why aren’t Newton’s theories supplemented with Einstein’s more general ones to give students insight into our present best understanding of our universe?" asks Blair. To promote the teaching and learning of Einsteinian physics, he founded the educational project Einstein-First. It is usually only in advanced physics courses or at universities that students might first encounter curved space and warped time. Science educators, it seems, have been slow to catch up. Since they can’t use the mathematical language of general relativity in their classrooms, science educators and teachers have to find creative ways to communicate relativistic concepts in the classroom. One such way relies on a simple world map. There is a surprising similarity between the geometry of a world map and the geometry of spacetime around Earth. Taking this link as a starting point, physicists and educators have suggested new models to illustrate general relativity at the high school level. The underlying problem is, in its essence, one of navigation. Back in the Norwegian physics classroom, about a dozen pairs of final year students group around the world maps on the screens in front of them. They assume the role of pilots, taking off in Oslo and aiming for New York. Crossing the Atlantic Ocean, they have to take course. What should their flight route look like? What is the shortest path between Oslo and New York? A red circle pulses over Oslo and invites them to draw their route to New York. Soon enough, the students figure out that a straight line on an ordinary world map does not correspond to the shortest path between the two cities. The shortest path is actually a curve that bends towards the North Pole. The ability to distinguish a straight line from a curved line is crucial to understand the physics of gravitation. When describing the movement of objects in the gravitational field of the Earth, say an apple falling to the ground, physicists unpack the movement by plotting position versus time onto spacetime diagrams. The trajectory in the diagram is a straight line only if there is no force acting on the object. A curved line, however, indicates the presence of an attractive or repulsive force. Even so, our geometric intuition of straight and curved lines can be easily tricked: geographic maps provide a familiar example of straight lines that look curved, and vice versa. Since the surface of the Earth is curved, the scale of distance on a world map varies according to your location on the map. The further away you get from the equator, the more distorted an ordinary map gets. Australia, for instance, appears a lot smaller than Greenland when in reality it is almost three times larger. The difficulty of judging distances on a world map arises from translating between two and three dimensions. One has to project a curved three-dimensional space onto a flat two-dimensional representation. If you were unfamiliar with the distortions of a world map, you might interpret the curved flight route of a plane as a force pulling you towards the North Pole. But there is no force pulling the plane towards the north — it’s just geometry. Quite similar to the varying scale of a measuring stick on a world map, curvature of spacetime warps distances and time in the world around us. In contrast to Newton’s assumption that distance and time are measured the same everywhere, Einstein described the scales of length and time as varying depending on where you are in the universe. One minute on the ISS space station does not correspond to the same length of time as a minute on the surface of the Earth. When drawing spacetime diagrams, one has to take this distortion into account. And it turns out that the map’s geometry closely resembles the geometry of a spacetime diagram for, say, a falling apple. Warped time and curved space cause straight lines in spacetime to appear curved. Again, there is no force of gravity pulling objects to the ground — it’s geometry. Novel science calls for novel teaching methods. Norway is one of few countries that has introduced Einstein’s theory of general relativity to its high school physics curriculum. In taking a pioneering role in the educational advancement of modern physics, the country has laid ground for the development of innovative learning approaches. With the educational project ReleQuant, Norwegian physics educators are among the first to bring the world map model for exploring curved spacetime into the realm of digital learning. Steier designs digital learning experiences. As part of the ReleQuant team, he has helped to design a digital learning environment for general relativity. When testing the learning resources, he was surprised to see how engaged students became when working with the world map activity. 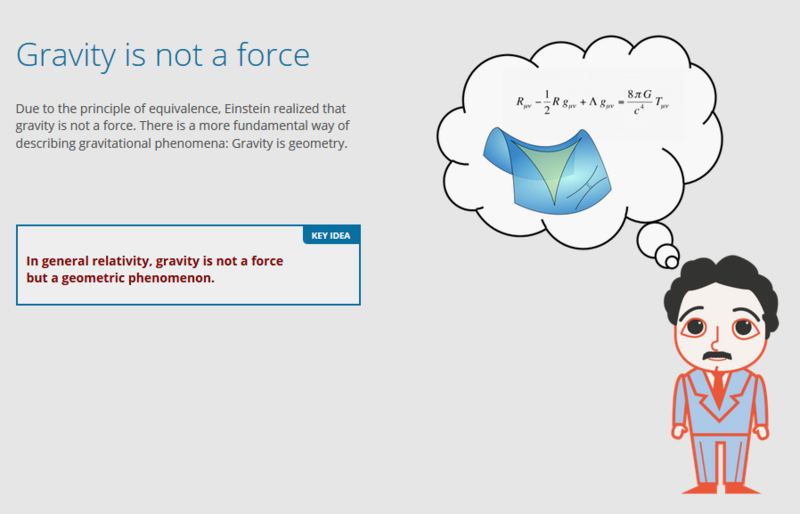 This year, the Norwegian Centre for Science Education released the open-source learning environment General Relativity. At the heart of the program lies the unit on curved spacetime. In a series of interactive simulations, students explore the geometry of world maps and transition to explorations of warped time. By being able to actively switch between the classical (flat) and modern (warped) understanding of the universe, students build a qualitative understanding of general relativity. And a qualitative understanding might be all it takes to explain how gravity reflects the geometry of our universe. The Norwegian students seem to agree. They discuss actively, while drawing and erasing lines on their spacetime maps. In the future, they might look up at the two-dimensional night sky and recall that they live in a four-dimensional universe whose curvature keeps them safely stuck to the Earth.